The textile machinery manufacturer, KARL MAYER, is participating more and more in shows concentrating on applications and end-uses. “We want to pick up customers at key textile areas and introduce them to something new by offering innovative textiles and concepts,” says Oliver Mathews, the Sales Manager of the Business Unit Warp Knitting, when speaking about the aims behind this decision. The next important date in KARL MAYER’s diary of events is ISPO Munich. KARL MAYER can be found here on stand 408 in hall C4 of Messe München – right at the centre of the exhibition’s trends hub. KARL MAYER will be demonstrating the performance features of warp-knitted textiles on an area of 120 m², surrounded by the latest fabrics, styles and accessories. ILE-CIRCUIT shows how electrically conductive yarns can be incorporated directly into the textile in a single step during fabric production. The positioning of the electrically conductive yarns is done to meet the requirements of the intended end-use. 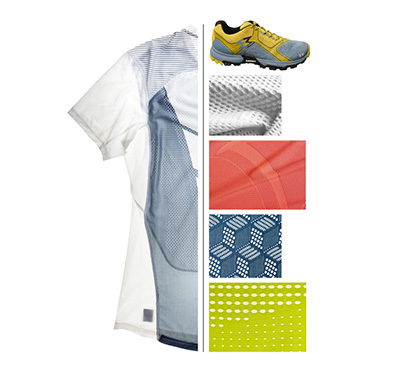 For example, this can produce warp-knitted textiles having sensor functions, which are opening up completely new potential applications in the sportswear and outdoor sectors.